Thanks to its unique antibody KD determination platform, ProteoGenix is THE reference in antibody affinity measurement. Measuring interactions with cells, bacteria, proteins in native conformation or performing high throughput KD determination is now made possible thanks to our 3 technologies! Send us your requirements and our PhD account managers will define the best solution to reach your accuracy/price/timeline expectations. Antibody affinity measurement by SPR, SPRi or Octet. Even compatible with high throughput KD determination. We are one of the only service providers proposing antibody KD determination by SPRi. No additional lead time, no extra cost, no artifact or bias (occluded binding site, false hydrophobic interaction). Need an advice to select the right technology? Our scientific account managers help you choosing the most relevant technology. Get your antibody KD values in 2/3 weeks. An antibody affinity measurement service adapted to your needs! Having already developed and characterized 300+ monoclonal antibodies for various customers, ProteoGenix acquired a strong expertise in biomolecular interaction analysis. Whether your project implies high throughput KD determination or crude sample analysis (cell, bacteria…), we have everything in hand to bring the most relevant solution to your requirements. Any doubt about the most relevant antibody KD determination technique for your study? Send your requirements to our PhD account manager. We were requested by a customer to measure the anti-protein X antibody binding affinity against a transmembrane protein X expressed at the surface of 293T cells. Expressing and presenting the protein directly in the cell allowed us to present the extracellular epitope while maintaining its native conformation. Measurements were performed using Surface Plasmon Resonance Imaging technology (Horiba XelPlex). The biochip was modified using a classical amine coupling strategy. Briefly, a –COOH terminated surface was activated using EDC/NHS leading to a reactive sulfo-NHS ester. This intermediate is known to react with primary amine to form a stable amide linkage. 2 anti-X antibody deposition methods were further tested in order to determine the optimal spotting approach (details provided in the PDF file). X protein cells specific binding was tested by comparing kinetic curves obtained by injecting X protein cells and control cells (293T cells transfected by an empty plasmide) over an anti-protein X antibody modified biochip. Comparison of X protein cells and control cells injections on the anti-protein X antibody modified biochip lead to clear differences in the kinetic curves whatever the conditions of immobilization. Therefore, the data obtained demonstrate specific binding of X protein cells to anti-protein X antibody. Kinetic curves were obtained by injecting X protein cells over the anti-X protein antibody modified surface at different concentrations. The deposition method that was chosen is the one that gave best results in first study above. Kinetics parameters were determined by fitting the curves at different concentrations using a 1:1 interaction model. Antibody KD value was obtained by calculating the kd/ka ratio. Specific binding of X protein cells to the anti-X protein antibody was demonstrated by SPRi. SPRi signals allowed measuring a low apparent KD which can be interpreted as high affinity antibody-cell interaction. This binding affinity is mainly governed by a high association rate (ka). The multiplexing configuration of SPRi allowed immobilizing the anti-X protein antibody on a same biochip with the two different immobilization methods and at four different concentrations for each immobilization method. During this experiment, 8 different experimental conditions were tested and 282 different sensorgrams were generated in a single biochip. We were requested by a customer to measure the KD of an antibody/antigen interaction via Biacore. The project dealt with the affinity ranking of 5 different antibodies against a same antigen. Antigen was immobilized on the dextran coated biochip surface via classical maleimide chemistry leading to stable covalent thioether bonding. Solutions containing the antibodies at various concentrations were then flown over the antigen. 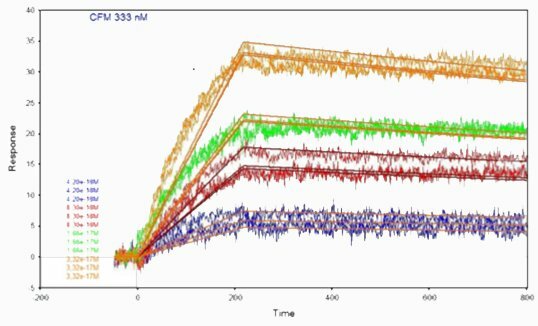 Measurement of the SPR signal at different antibody concentration allowed the determination of the kinetics parameters (on-rate ka, off-rate kd) and thermodynamic parameters (KD). The antibody/antigen binding affinity can be deduced from the kd/ka ratio leading to the possibility to deduce the affinity ranking. Antibody affinity ranking can be deduced directly from the antibody KD value as the lower the KD value the higher the affinity of the antibody. Favorable kinetic parameters (fast association rate and low dissociation rate).